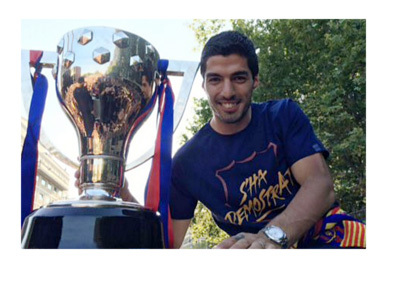 Luis Suarez of Barcelona FC is this season's top goalscorer in Europe, with a total of 40 goals in the Spanish La Liga. This is the second time he has won this award, first time being with Liverpool in 2013/14. El Pistolero finished things off in style on Saturday with a hat-trick vs. Granada in the last round of the Spanish league. This makes for a total of 53 goals across all competitions for the Uruguayan. This is the first time that a player not named Messi or Ronaldo has won the Spanish League top goalscorer title (Pichichi) since 2008/09. Elsewhere in Europe, Lewandowski won the top goalscorer award in Germany and became the first non-German to score 30 league goals in the Bundesliga. Zlatan, with 38 league goals to his name, nearly doubled the tally of second placed Alexandre Lacazette in the French Ligue 1. In England, Harry Kane is the man with 22 goals. In Italy, Gonzalo Higuain cleaned up scoring 36. He became the top goalscorer ever in Italian Serie A. He needed a hat-trick in his last game vs. Frosinone to accomplish this, and he got it.